I walk to the gate for Qantas Flight 107 Sydney to New York, talking on the phone to Janelle, the mother of (International Criminal Court Australian lawyer) Melinda Taylor. I tell her that the latest advice on her daughter – still imprisoned in Zintan, Libya, after 20 days – is “less than encouraging”. But at Los Angeles a message from our Ambassador David Ritchie: Melinda Taylor is likely to be freed. Forthwith. The jet fatigue lifts. Ambassador Ritchie is to drive to Zintan that day to collect Melinda and fly to Rome on an Italian military aircraft. On to New York and Australia’s Mission to the UN. Since the ‘50s, our UN ambassador has lived in a 1930s apartment in Beekman Place on the East River, a block from the UN. Helena and I sink into the sheets in the guest room, amid the roar of traffic and loud clatter from the air-conditioning. Must be money for an upgrade in the next federal budget. I’m here to help squeeze a new treaty out of the United Nations. One that will rein in and regulate the trade in small arms – like all those AK-47s, Kalashnikovs, in the arms of buy soldiers in West Africa. Australia’s been behind this treaty from the start – these weapons are claiming around 2,000 lives a day. I roll up to a breakfast with foreign ministers from the UK, Finland, Kenya, Japan, Costa Rica and Argentina – with us, the original seven sponsors of the arms trade treaty. The hard negotiations start: should the actual treaty include ammunition? Rocket –propelled grenades? Tanks? And can we persuade China? Later we turn up in the UN General Assembly hall. I take my seat behind a desk with the placard “Australia”, proud to be a kid from Matraville High School representing his country in this historic location. But elation quickly dissipates before the chairman even declares the meeting open. There’s a dispute over the status of Palestine. Delegates caucus in corners. I take the opportunity to move around and shake hands with a dozen ambassadors and foreign ministers, gently seeking votes for Australia in the October ballot of the Security Council. Much goodwill, but from the corner of my eye I see our competitors from Finland and Luxembourg. A text confirms Ambassador Ritchie has reached Zintan, accompanied by a Libyan minister who will speak directly with local authorities. Smiles all round, but no sign of Melinda. 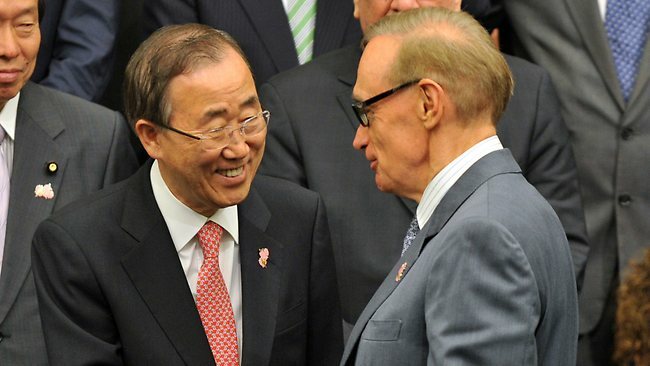 An afternoon meeting with Ban Ki-Moon, UN secretary general. He heaps praise on Australia’s aid program and we talk Syria, the Pacific and East Timor. Then good news – Melinda Taylor released and en route to Tripoli’s military air base to get out before the evening curfew. I call her husband and parents, their anxiety now gone. A two-year-old is about to see her mother again. At 5pm a reception in an East River tent, hosted by us and Costa Rica to promote the arms trade treaty. I shake hands with up to 50 ambassadors and foreign ministers, talking up arms control and our Security Council candidacy. The ambassador from Somalia tells me how the weapons trade has devastated his country for more than 20 years. More than 875 million small arms in circulation worldwide. That’s nearly one handgun or Kalashnikov for every eight people alive, including children. Proud – very proud – that Australia is taking a lead in reining this in. Jet lag fells me. I sleep like the dead – until 2am. Doing early morning pilates on the floor of the bedroom. I watch CNN footage of Melinda Taylor arriving in Rotterdam: Would love to be there when her toddler Yasmina gets picked up by her mother. Walk up to the UN building, which is undergoing heavy refurbishment. Concrete floor, exposed plumbing in the ceiling, thrown-together artworks from different countries. And there’s bad news: the conference is still deadlocked over Palestine. Our arms control treaty is going nowehere. At 11am I cross the road to the fortress-like headquarters of the US embassy to the UN, to meet their Ambassador Susan Rice. I met her when she turned up at an Australian-American Leadership Dialogue in 2007, a young adviser to a barely-known candidate for the US presidency, Barack Obama. As old friends we’re able to move quickly through the agenda. Walk back in baking New York heat to host lunch for 17 ambassadors from small island states, including Vanuatu, Seychelles, Fiji, Barbados and Cuba. It turns into a seminar on fishing rights, coral reefs, rising sea levels and ocean quality. On these issues they see Australia as a friend. Then back up to speak to a General Assembly forum on aid. I mention our aid to Bangladesh, and – a happy coincidence – the Bangladeshi ambassador is sitting on the other side of the Austrians, in reach of a friendly handshake. Back to the residence to host a reception for foreign ambassadors, including Haiti, Laos, Guinea and Niger, who we’re bringing to Australia to build links on peacekeeping and on sustainable development. Suddenly a message: a compromise over the Palestinians means our conference on arms control can begin. I race back to the General Assembly just in time to follow the assistant foreign minister from Japan, and speak – loud and clear I hope – for Australia. That night, despite the roar of the air-conditioning and traffic, and the jet lag, I again sleep like the dead. While America is on holidays I make a phone call to a European foreign minister – won’t reveal the name – and talk cooperation on the International Criminal Court, the rights of women and Security Council reform. I also put the case for our Security Council bid. Then a pilgrimage up the Hudson River (I wish Australia had rivers as broad as this one) to an American sacred sit – West Point, established by President Jefferson in 1802. Something to talk about when I meet American brass in Afghanistan. While I’m talking counter-insurgency, a call comes through from Melinda Taylor. Unbelievably she’s back at work at her desk in the ICC, and in high spirits. She says she saw me on French TV from her cell. A busy day – keynote address at the UN, this time on development aid and co-operatives – restarting local economies destroyed by famine and war. And a quick dash to JFK for the 5pm flight to Paris. No junket, this – we’ll land there at 6am, head across town for talks on Syria, then another airport dash to make flights to Tokyo for talks on aid to Afghanistan. The 6th East Asia Summit (EAS) in Bali in November 2011 — with the United States and Russia in attendance for the first time — was a triumph for Indonesia and for the Association of South East Asian Nations (ASEAN). The expansion of the EAS — whose foreign ministers will meet in Cambodia in July — brought to fruition a vision cherished by many in the region. It creates an institution with the membership and mandate to help manage an increasingly crowded strategic landscape, ensure outward-looking regionalism continues as the bedrock of Asia-Pacific integration and foster habits of cooperation. Fittingly, this achievement comes on the cusp of profound change in the Asia Pacific region. With the shift of economic and strategic weight to Asia, we are all challenged to adapt to a new emerging global order — one in which our mutual security and prosperity increasingly relies on our ability to work together in the common interest. No-one can deny that Asia is rapidly assuming its place as the driver of the world economy for the 21st century. In January, the Economist reported that within five years, China would have a larger economy in purchasing power parity than the United States.1 Based on reasonable projections at relative real growth rates and the relative values of the US dollar and the yuan, China will also have the larger GDP as measured by market exchange rates within the next seven years. At the same time, Japan remains the world’s third-largest economy, while economies like India, Korea, Indonesia and Australia — all G20 members — are growing rapidly. Indonesia, under the policy direction of President Yudhoyono and his economic team, is likely to emerge as one of the top six economies in the world by 2030. For the foreseeable future, the United States will remain the single most powerful global and regional state through a unique combination of military, economic and soft power — the only nation capable of projecting power globally. Moreover, President Obama has made a deliberate and strategic decision that, as a Pacific nation, the United States will play a larger and long-term role in the region, directing his national security team to make the United States’ presence and mission in the Asia-Pacific a top priority. 3 This commitment is reflected in the US defence priorities document issued in January 2012, which makes it clear that cuts to the US defence budget will not come at the expense of the Asia-Pacific. But it is also the case that the absolute margin of United States pre-eminence will continue to narrow as more economic and strategic weight moves to Asia. While the United States remains the world’s biggest military spender and will remain so for decades to come, the acceleration of military spending has been much higher in Asia than it has been in the United States. China’s spending is up by 335 per cent for the decade to 2010, Russia’s by 368 per cent, and India’s by 183 per cent.4 This increased investment means regional militaries are gaining longer reach, with greater buying power for new technology, faster deployment of updated equipment and improved cyber and other non-conventional capabilities. All this potentially means greater capacity to deny access to strategically or economically important parts of Asia. It is not just the rising strategic and economic weight of the Asia-Pacific that makes its regional arrangements important. It is in this region where many of the interests of the United States and China will need to be managed. US pre-eminence has been the bedrock of Asia-Pacific stability for the past six decades. It has provided the strategic breathing space which has enabled the East Asian miracle. Both the markets and the military of the United States have been crucial to the growth of Japan, China, the Republic of Korea and the countries of ASEAN. China has emerged from successive financial crises — regional and global — as a driver of Asian economic growth. Its remarkable economic development and growth over the past three to four decades is a product of considered statecraft in pursuit of its historical place as a respected great power. How China puts this power to use, and how Asia responds to China’s rise, will continue to shape our collective pursuit of peace and prosperity within the region. A policy of containing China is neither desirable nor feasible. What we should continue to strive for is a China that fundamentally accepts, and sees it as being in its own interests to support, the global and regional rules-based order — to seek to influence it, but not to defy it. A China that is constructively engaged in the global and regional community and committed to the peaceful resolution of differences will be a positive force for the region and the world. It is fundamentally in all of our interests that China and the United States are now together in the EAS along with the rest of the expanded EAS membership. One of the key advantages of the EAS is that it offers a venue for transparency and collaboration that, over time, can build confidence and trust, drawing on the spirit of cooperation that is already well-established in other ASEAN-centred forums. The concept of common security is as much a habit as it is a concrete doctrine guiding specific actions. The habits of regular leaders-level dialogue on an agenda that includes security policy is itself inherently normalising. The future of Asia is not, of course, some Sino-American duopoly, as fundamental as the Beijing-Washington relationship may be. Regional countries face a range of challenges not directly or even remotely related to US-China relations. Apart from changing great-power relationships, these include: unresolved territorial disputes, rapidly expanding military budgets, nuclear proliferation, the growing impact of transnational crime, natural disasters, human pandemics, energy and food security, maximising economic growth and the stability of regional financial institutions. Such concerns cannot be resolved by national action alone; they require properly coordinated regional responses driven by regional institutions which themselves encourage the culture, habits and practices of cooperation. The countries of our region are acutely aware that both continental and archipelagic Asia is still beset by unresolved territorial disputes, each capable of undermining the prosperity we have seen so far. These include the Korean Peninsula, the Taiwan Straits, the South China Sea and Kashmir. There is a strong interest across Asia in how we collectively chart our course — and build a capacity to generate platforms for dialogue on problems that may seem intractable. . There is also a common desire to build the institutions and the habits of cooperation, enabling us to deal with individual security challenges as they arise, and over time to incubate a culture of common security. The shift in economic and strategic weight to Asia, the confluence of interests of major powers in the region and the expanding range of transnational challenges demanded a change to existing regional structures. We have in our region examples of highly successful regional institutions, none more so than ASEAN which has played a vital role in building a stable strategic foundation for South East Asia. Before ASEAN’s creation, this was far from certain. The Asia Pacific Economic Community (APEC) grouping has also played a central role supporting trade liberalisation and economic reform. The view commonly held, however, by Australia and others is that no matter how successful these institutions have been, they are not equipped to develop the sense of community necessary to address collectively the range of emerging challenges across East Asia. In April 2010, ASEAN leaders gave the strongest push yet to the idea that reform was necessary when, at the 16th ASEAN summit in Hanoi, they encouraged the United States and Russia to deepen their engagement in an evolving regional architecture — an invitation that led ultimately to President Obama’s and Foreign Minister Lavrov’s participation in the EAS in Bali in November 2011. The significance of the expanded EAS as a regional institution is clear. Based on 2010 figures, EAS countries represent 3.8 billion people, or 55.1 per cent of the world’s population and 54.9 per cent of world GDP. Eight EAS members are in the G20 and three EAS members are permanent members of the United Nations Security Council. The region is also home to the world’s five largest armed forces, four of which belong to members of the EAS — China, the United States, India, Russia — and the other belonging to the DPRK, whose military capacity is also of great strategic interest to the region. The strategic rationale for the expanded EAS remains as it was when the idea of such an Asia Pacific community was first promoted by the Australian Government. No national responses — no matter how well crafted — will be enough to resolve the range of challenges confronting us, and until the Bali summit meeting there had not been a single institution with a wide enough membership and mandate convening at leaders’ level. Last year’s Bali summit represented an historic opportunity to begin crafting a common vision for Asia’s future, and it yielded concrete results. It was particularly significant that leaders were able to speak directly about security issues, including the South China Sea, in a constructive and non-confrontational atmosphere. Further, agreement was reached on a joint Indonesia-Australia proposal to strengthen regional responses to national disasters, working with other regional groupings. This is a major priority for our region, as well as an important area of potential soft security cooperation between the emergency services and the armed forces of the region. Leaders also tasked EAS finance ministers to meet again in 2012 in recognition of the urgent need to craft a practical agenda for financial collaboration for the future. The Eurozone crisis demonstrates the need for systematic engagement between our respective financial systems and regulators, given the global financial volatility that continues to prevail and the capacity of a financial crisis rapidly to precipitate a broader economic crisis. Finally, further steps were taken in social and environmental policy collaboration, with agreement on regular ministerial meetings on education and collaborative work on climate change and sustainable cities. None of us are naïve about the capacity of the EAS to deal with all the challenges confronting its members. Yet, while there will be many testing times ahead, it is clear that we have made a solid start on the broader regional agenda. The task ahead of us at the 7th EAS meeting in Cambodia this year and beyond is to strengthen and entrench the EAS leaders’ level dialogue and advance practical proposals for cooperation on the broad range of economic, political and security challenges confronting our region. Australia will continue to work with others to this end, as well as seek better to link the work of the EAS with other ASEAN-centred regional groupings such as the ASEAN Regional Forum (ARF) and ASEAN Defence Ministers’ Meeting Plus (ADMM-Plus). The expanded EAS should aim to keep the reform process moving forward, nurture a culture of dialogue and collaboration on security, and provide a vehicle for discussion and cooperation across a range of challenges. The founding members of ASEAN in 1967 and those of APEC in 1989 were realists as well as long-range strategists. Realists because they dealt with the world as they saw it; strategic thinkers because they understood that, in an increasingly interdependent world, growth and prosperity must be underpinned by new forms of regional cooperation. They saw that regional institutions were important in addressing those collective challenges that no one country could address alone. More than four decades after the founding of ASEAN and two decades after APEC, regional leaders have decided that further changes to the region’s architecture, with a higher level of ambition, are needed. The purpose of this reformed architecture — the newly-expanded EAS — is clear: to serve the common interests of Asia Pacific countries in a more broad-ranging format that intimately links our prosperity with our security. Strong bilateral relations and national interests will remain of fundamental importance, but in the words of the 1967 ASEAN Declaration “peace, freedom, social justice and economic well-being are best attained by fostering … meaningful cooperation among the countries of the region”. It matters now for the world’s future how Asia manages its own future — and whether the future of the Asia Pacific is pacific both in its name and in the norms it embraces in dealing with the challenges of the new century. It’s a challenge to govern when the numbers in parliament are equal and a cluster of independents determine whether a bill is passed or not. But we’ve had a bit of experience with this at State-level in Australia. I watched as Coalition Premiers Nick Greiner and John Fahey juggled a relationship with independents after NSW Labor won the Entrance by-election in 1992 following a narrow Coalition win after the State election of 1991. Yet I learnt this: independents are very reluctant to bring a government down. It’s a big decision. They are open to criticism if it’s the wrong call. They could pay a price in their own electorates. They understand the community wants a stable government and there will be a lot of anger in the air if they vote for a handover on the floor of the Parliament or bring on an early election. It took a corruption finding against Nick Greiner by the Independent Commission Against Corruption to force the issue in New South Wales (a finding later overturned in the NSW Supreme Court) to force this issue in NSW. In the absence of such exceptional circumstances there is a likelihood that the Gillard Government survives with cross-bench support for its three year term. Certainly business would be wise to plan for this as a strong probability. This has been a close call for the Green Party. If Abbott had got over the line there would have been no action on carbon pricing for three years. Yet there would have been a carbon price operating in Australia if the Greens had supported Kevin Rudd’s ETS back in December. They held it up in the Senate for a crucial period in which climate change denial took hold of the Coalition and then the Green Party voted with the Coalition to defeat it. The Green Party supporting a Labor Government will mean nothing if at the end of three years Australia is not pricing carbon. I believe Ross Garnaut can be recruited at a moment’s notice by Prime Minister Gillard to design an interim carbon price that would satisfy the Greens and pass the Green-ALP dominated Senate; the only question is, would it pass the House of Representatives? Assuming Windsor and Oakeshott support it and Turnbull backs it the answer is, yes – even if Katter were to vote no. The media might start to report and analyse the Green Party – just for a change. The key story here will be how quickly the party will mature from a party of protest into a party of negotiation, holding its base but compromising as necessary to get legislation through. Making concessions but carrying its own forums – conferences, or councils or collectives, whatever they are. We don’t know because the media and the Canberra press gallery have decided that this is the one political party whose pre-selections and conferences and factions can never be analysed. All the others, quite legitimately, are fair game. Pricing carbon is one of the big issues for this new more interesting parliament. The other is a tax on mining profits. I’m presuming that Labor will not want to go to the left of what it has negotiated with the big miners. Here, then, is the first compromise required of the Greens: to forgo all their virtuous redistributist talk about a mining tax and to settle for a more modest version. The price for this? I guess lots of bicycle tracks. The Green legislators will bear in mind the key performance indicator I pointed to above, namely, whether Australia emerges with a price on carbon, either a tax or an interim price set for the opening phase of an emissions trading scheme. Meanwhile the one question for commentators on NSW state politics is what will Barry O’Farrell do, given that all the opinion polls make him the next Premier by a big margin. He’s on the record with a commitment to privatise the desalination plant and to franchise out the management of Sydney ferries. It’s hard to see the sort of bold privatisations that many of his supporters might expect. The present Labor government should finish privatising the electricity retailers and the output of the generators by December (output, not the generators themselves – it’s called the “G-trader” model). The government has privatised State Lotteries and is privatising the State-owned waste authority. In my time, the government privatised the TAB, Freight Corp and the state-owned coal mines. Big privatisations, and successful ones. In a recent interview Barry O’Farrell said he would “borrow against the State’s Triple A rating”. Which is, borrow. Interesting to have a Premier from a conservative side say his chief policy commitment is to lift state debt when his Federal colleagues have come close to winning a federal election running against Labor’s debt. It’s a fiscal strategy that deserves analysis. In this phase there’s not much else in NSW politics to analyse. 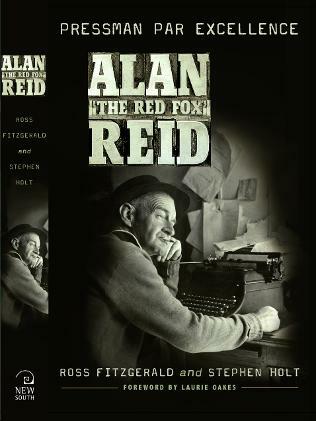 Bob Carr reviews Alan “The Red Fox” Reid by Ross Fitzgerald and Stephen Holt, A New South Book, and The Family File by Mark Aarons, Black Inc.
His 50 year career reporting Federal politics started in 1937 at The Sun. He switched to the Frank Packer-owned Telegraph in 1954. When he died in 1987, he was Kerry Packer’s personal emissary in Canberra, his lobbyist, as well as a reporter for The Bulletin and Channel 9. This was a brazen conflict. Yet his professional success subsumed all; he delivered scoops with mischief and relish and MPs spilt secrets to him like stricken sinners in the confessional. His most remembered front page appeared in March 1963 and put paid to the ALP’s chances of beating the Menzies Government in that year’s Federal election. A special ALP conference had met in Canberra’s Kingston Hotel to determine the party position on a U.S. communication station at North West Cape in Western Australia. Under the then-party rules its leader Arthur Calwell, and deputy, Gough Whitlam, were not delegates. They were required, somewhat pathetically, to stand outside under a streetlight waiting for unknown union and party officials to arrive at a policy and hand it to them. Reid grabbed a passing photographer and captured the humiliation of the Labor leadership at the hands of what became immortalised as “the 36 faceless men”. It was instant political devastation for a profoundly unworldly Labor Party. Reid was fond of the John Curtin – Ben Chifley era of Labor leadership and hostile to Santamaria who he portrayed as an “exotic” force. He even advised H V Evatt on his 1954 statement attacking the Santamaria forces. The statement provoked The Split and was entirely unnecessary as Santamaria’s influence was containable and, as leader, Evatt should have been able to straddle his party’s factions as indeed Curtin and Chifley had done. Evatt: Alan, you’ve left me…You’re anti-Santamaria but you’re not with me in this campaign… I’ll tell you something Alan, for every Catholic vote I’ll lose I will get two Protestant votes. Reid: You’re out of your cotton picking mind, Doc. In their biography, Ross Fitzgerald and Stephen Holt refer to Evatt’s “rapprochement, with Communists and fellow travellers in the broader labour movement.” This is a good insight, the key to Evatt’s position through the Split. This rapprochement, or accommodation with a pro-Communist Left was documented by Reid in story after story, especially after he joined The Telegraph and his contempt for Evatt merged with Sir Frank Packer’s fierce conservatism. When Ross Fitzgerald told me he and Stephen Holt would write a biography of Alan Reid I told him the material would be too scant, the result too meagre. The authors have proven me wrong. They have written an invaluable history of the interaction of the press gallery and politicians. The same is true here, I suggested. Through the 50s and 60s Reid and his tabloid insights into Labor, Communism and Evatt would have offered more truth than the pages of Meanjin or Outlook. Reid would have found little to disagree with in The Family File. On the surface this is surprising because Mark Aaron’s book is the story of four generations of a family of communists. But it is told – hence its unique flavour – through the archives of the Australian Security Intelligence Organisation (ASIO). The author’s good sense – he let lapse his Communist Party membership in 1978 – rescued it from being another soft-headed memoir of heroic revolutionaries struggling for peace, worker’s rights and democracy. In 1959 as a boy Mark Aarons saw a car pulling into the backyard of their Fairfield home and a suitcase being handed to his father, Laurie, then the General Secretary of the Communist Party of Australia (CPA). Opened, it revealed wads of cash; he later learned, 45,000 Australian pounds from the Soviet Union, sent through a Romanian trade union, to keep Australian Communism afloat. The revelation at the epicentre of the book, however, is the story of the party’s involvement in Soviet espionage. Enter stage left the conspiratorial figure of Wally Clayton who, from 1942 and at the direction of the CPA leadership, worked with the Soviet embassy in Canberra. He collected files from party members and sympathisers in the public service in Canberra and delivered them to the TASS correspondent located in Kings Cross, Sydney, who was the local KGB man. After the CPA dissolved itself in 1991, Mark’s father, Laurie, who had been the party’s national secretary from 1965 to 1976, taped an oral history interview with Clayton, by then 90 years of age. Clayton admitted in this tape that he delivered material to Soviet intelligence, something he had insolently denied at the Petrov Royal Commission, and that he had done it at the request of then party secretary Lance Sharkey. This revelation should nudge Australian historians towards a more benign view of the Petrov Royal Commission into Soviet Espionage (1954 – 5) that had been denounced so thoroughly by Evatt and criticised by Labor-inclined historians. After the Commission, Laurie Aarons claims he terminated any relationship with the Soviet embassy that may have fed intelligence to Soviet spies. He’s quoted by Mark saying, “The thing about spying is that it’s a very dangerous thing to have alleged against you.” True indeed. Yet Mark Aarons reports that a first secretary of the Embassy, Ivan Skipov, was to beat a path to Bill Brown, a CPA leader and later a leader of the pro-Soviet breakaway, who gave him the names of sympathisers. To people like Brown, the Soviet Union was the country of the mind, the object of their patriotism. For Labor party people the most arresting material in Mark Aaron’s book is the confirmation that the CPA recruited and managed dual ticket holders, that is, left wingers who held secret membership in the Communist Party while they held office in the ALP. The big fish here was Arthur Gietzelt, eventually a Minister in the Hawke Government. This practice, of course, magnified the influence of a relatively tiny Marxist Leninist party, giving it a say – how much can be debated – at ALP conferences. Some leftists have said in reference to Aarons’ book, “Big deal. Everybody knew it.” Maybe. But we’ve never had a combination of ASIO file notes and a member of the Aarons family laying it down for the record. Moreover, no dual ticket holder has ever admitted it; Gietzelt denies it now. And historian Stuart Macintyre in his writings on the history of the CPA never revealed it. A book is now being written on Gietzelt and research taking place on others in the Labor Left who may have kept dual membership. A number of ALP leftwingers could be revealed as long-term CPA plants. As a result some or much Left activism could be exposed as something other than indigenous Labor radicalism – more like emanations and diktats emerging from a Marxist Leninist party that could never poll one percent at a general election under its own name. This has implications for the historiography of Australia in the Cold War era. It strengthens the indictments of Evatt and Calwell because they accommodated what we can probably now objectively define as a pro-Communist left and thus made Labor close to unelectable. It elevates Gough Whitlam’s role as the leader who broke the power of the Victorian ALP executive and prevented Jim Cairns becoming Labor leader. In acres of speeches and writings on foreign policy by Cairns a single criticism of the Soviet bloc would be a discovery of gem-like value. Perhaps not a dual ticket holder, he wore the appellation “fellow traveller” like a second skin. The revelations are also a historic justification for the existence of a NSW – based Labor Right with a lineage embracing Premiers McKell and Cahill (the later warded off both Santamaria and Evatt forces as his government 1952 to 59 became the only State Labor government to survive The Split) and machine-man John Ducker who blocked a Gietzelt-led takeover of the ALP’s biggest branch in 1970-71. Gietzelt-led? Knowing what Aarons and his ASIO files have confirmed one can write, rather, communist-led. Paul Keating took over from Ducker when control in NSW Labor again wobbled in 1979-80. From his time in Young Labor the hard left have always been “the comms” to Paul Keating. Gietzelt’s wife Dawn was once over-heard saying she “did not care which labor party her children favoured” and clearly meant the CPA was to be regarded as another labor party. Obviously no reader of Solzhenitsyn, she – like the ALP Left of her generation including Cairns – could never see the difference between the totalitarian and democratic brands of socialism. I always suspected their spiritual homelands were the “peoples’ democracies” of Eastern Europe and was always inclined to imagine them as members of an Australian Politburo wolfing pork and caviar at banquets for visiting Soviet delegations and, with a bark or two, despatching social democrats and liberals to the Gulag. A former Tribune editor Rupert Lockwood once told me that in a lifetime in the CPA he had met people perfectly capable of lining enemies against a wall and machine-gunning them. ASIO penetrated the CPA comprehensively, its agents were present at every meeting and even worked as full-time staff. If this were over-kill then the espionage of the 40’s, now confirmed, provides the justification. I find myself hoping that ASIO now shows the same spy-craft as it infiltrates every Islamist cell that harbours the faintest enthusiasm for blowing us up. And I’m struck by ASIO’s restraint. After all, a leaked copy of the Gietzelt’s ASIO file could have killed Labor’s chances at any number of elections. I know one journalist who would have torn a half-proffered copy from an agent’s gloved hands. He, above all, understood the implications. The adjective “explosive” or the noun “time bomb” would have been in the first paragraph of his Telegraph exclusive.